Jeni and Tim were so excited to head to Costa Rica a few days ago to see their daughter, who lives there, marry the man of her dreams yesterday (9/3/16). If you know Jeni, you know how much Tim means to her, and how wonderful that love is that they share as husband and wife. During the wedding, after the father-daughter dance, Tim had a heart attack. Sadly, he didn't survive it. Our hearts are broken for his wife, Jeni, and their entire family. Through the shock of their terrible loss, Jeni has to now deal with arrangements and expenses that she wasn't at all prepared for. I know that Jeni would be so grateful for any donation that you can make, and of course, prayers for her and their family. Tim served as a Detective for the York County Sheriff's Office in Rock Hill, SC. 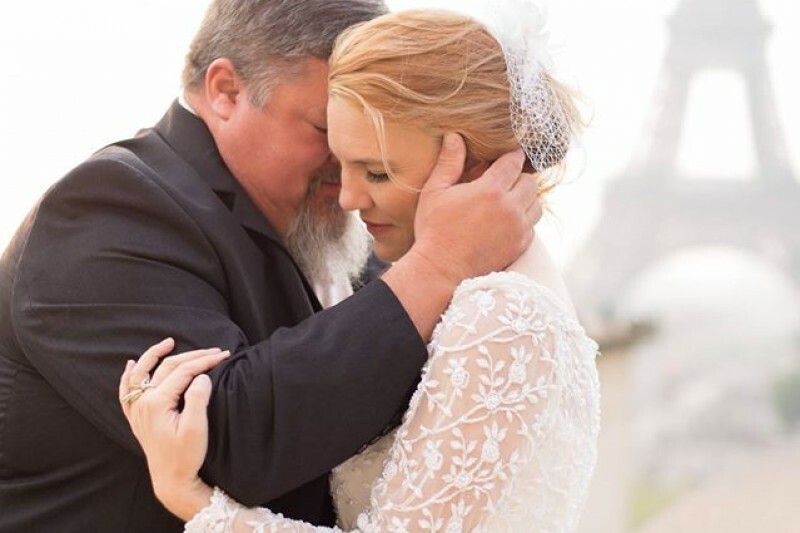 Many of you know that Jeni is a wedding photographer, and understandably, she will need some time away from that after such a tragic event at her own daughter's wedding, so any financial help would be greatly appreciated. Thank you for your support during this very difficult time. Thank you so much to all of you who have prayed, shared, and donated. We have reached our goal. This will help Jeni take care of things as she moves on without her beloved husband by her side. Please keep Jeni and her family in your prayers, as they still have such a long road ahead. "Family was the most important thing to Tim, to the point that he ignored his body telling him something was wrong. He should have gone to the doctor, but he was afraid that he wouldn't be able to attend our daughter's wedding. Every one of us wish he was still here and hadn't ignored the signs that something was wrong. If there is anything you can do for us, it is to take care of yourself and your loved ones. If we can save just one life with our tragedy, then he can be a hero one more time." Wow. We are overwhelmed with the outpouring of love and support for Jeni and their family. We surpassed the halfway mark in less than 24 hours. Thank you SO much to all of you who are praying, sharing, and donating. Thank you for being there for Jeni when she needs it most. Please keep sharing, and especially keep praying. Condolences on your loss. I know how this can be, as my mother died of a heart attack shortly after leaving my wedding to return home. If you for whatever reason ever needed someone to talk to who has been in the same situation, don't hesitate. I am so very sorry for your loss. My thoughts and prayers go out to you and your family. Just try to remember your dad knew before he went to be with the Lord that his baby girl was happy. Desde San Jose Costa Rica, mis mas sinceras condolencias, lamento su perdida. La muerte no es más que un paso a una vida mejor. I just wanted to say that I am so sorry for your loss. I cannot imagine not only losing my father but at such a special time. You will be in my thoughts. I read and stroy I'm so very sorry for your loss I lost my Dad he became very sick and passed away always no that your Dad will always be with u and your mom and other family as well god bless you all. hold on to the specail days with your dad and your husband hold them close to your heart . So sorry to hear this. Prayers for the family. We lost dear friend sheriff deputy Ken Hill from Fort Myers FL on Monday, heart attack also. I am so sorry for your loss. I'm sure your dad is watching over you. God bless you and your family. Prayers to the family- Really sad- Thanks for his service. I will be back to donate but I just had share my deepest regrets to you and your whole family. My heart goes out to you all and sending prayers to hopefully help you all through this very hard time...words can't say how sorry I'am . I cannot even begin to imagine how you even absorb this kind of loss. It's just something that you don't ever think about. I am so very sorry for this family and I pray that they will find comfort in the kind words of so many here. May God Bless you and Give You Strength as you move forward. Again I am so very very sorry. Hey Jeni, This was a donation from the Men's Bible Study Group from Grace Covenant Church in Cornelius, NC. We are all praying for you and your family!